Christmas is a fantastic excuse to get the 3D printer out and make themed decorations and toys. We've had a 3D printer for a few Christmases now so we've built up a collection of cool models to print. 3D printed toys and accessories are perfect for putting into home-made Christmas crackers and christmas crackers. They are also brilliant for creating custom decorations for the tree or room. Or you could even print the Christmas crackers this year! I've included our regular favourite Christmas models to print plus some new models that we're trying out this year. The Snowflake Machine by mathgrrl is a new favourite for this year. 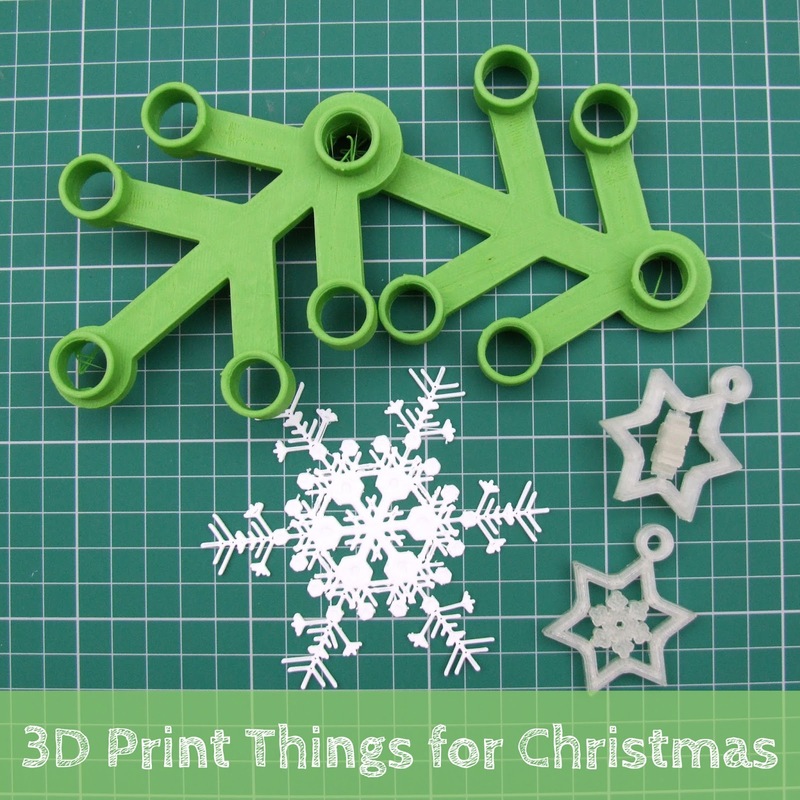 You can create custom snowflakes designs and then 3D print them. How awesome is that. And because the snowflakes are mostly empty space you won't need loads of filament. The printed snowflakes can be delicate and tricky to get off the bed, but they look fantastic. Older kids and can download the OpenSCAD program for generating the snowflakes and take a look at how it works. Younger ones can explore what happens when you change the parameters in the tool. The Gyroscopic Snowflake tree decoration has become one of our regular 3D prints even out of season! It prints in one piece but the snowflake in the middle rotates. Everyone loves to fiddle with it. This one makes a great gift for kids to give grandparents and aunts and uncles as well as being cool enough for teens. The Super Secret Cracker prints in one piece and can be 'pulled' to reveal a secret gift printed inside. These are a slightly larger print, but pretty neat. We've successfully printed and 'pulled' these. The Snowman Maker is a mould for making mini snowmen from real now. We'll have to wait for snow to try this out but it's a fab idea. Cork Pals: Frankly My Deer is a fab fun print that turns a wine bottle cork into a cute reindeer. Add a cork and you've got a great stocking filler or a table gift for the Christmas meal. The Giant LEGO-style Christmas Wreath is fantastic. You print a set of really big tree foliage pieces and join them together into a wreath and then add stud berries. Neat Idea. This one is big and takes a while to build. We're working on it!